Another inexpensive (not cheap) tenkara rod. 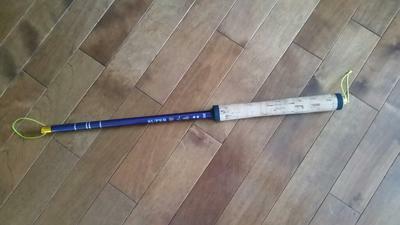 I purchased a inexpensive carbon fiber, telescopic, Chinese carp fishing rod. I have converted a few of these rods. I can't really say I made these rods. But I did install cork handle's on them! One is a 3.6M, the others are 3.M rods. I purchased the components on the auction site. I paid different prices for all the components? One rod I paid $9.35 for, one $4.05. I can't remember what I paid for the other. One cork handle I paid $4.03 for. One I paid $0.85. all included shipping! They cast as good as my Willow & Cane, and Maxcatch tenkara rods. Which I paid a lot more for! So either I am casting wrong, or my inexpensive tenkara rods are just as good as my real lower cost tenkara rods. I have found a lot of my casting ability, depends on the line I am using, mono, braided, or Furled. Comments for Another inexpensive (not cheap) tenkara rod. Carl - Have you caught any carp on those rods yet? I have caught several carp on my Kyogi 12 and 15. Those are similar to the length of your two rods. If at all possible I fish with the 18 or 21. The longer the better in my book. The biggest carp on the Kyogi 12 has been an 8.5 pounder and the biggest on the 15 has been a 14 pounder. Those fish taxed those rods to the Nth degree. I am not sure where the thrill came from on the Kyogi 12, fearing that the rod was going to break, or fighting the fish! I wasn't maxed out, but I bet I was well over 80% on each of the two shorter Kygoi rods in several fights. Last summer fishing the flats of the Snake river with my buddy Chaz, he hooked into about a 12 pounder with his Sage 8 weight. He was about 12 minutes into the fight when the Carp blew up his expensive graphite rod. So, Carl if your rods blow up when you get into the Carp, please let us know. I wouldn't worry near as much about your casting ability, as how are you going to land a fish on such a poor quality rod. At that price, there is no way that those rods have quality graphite or even fiberglass in them. So, let us know when your rods blow-up! It should be exciting. Carp are amazing fighters. Carl - I was out testing lines on the Kyogi yesterday. Maybe I didn't understand your post. Are you going to fish for trout and panfish with your carp rods? There were no carp on the flats at Lake Lowell yesterday when I was testing lines, but there were a lot of Blue Gills. I switched from my "Karp Kebari" to a size 12 Utah Killer bug and began catching some Blue Gills. On the Kyogi 12 and 15 that I was fishing it reminded me of watching the Tuna Fishermen that line fish in the Pacific. The rods have too much power, so there was no fight! I had my Diawa Sigiri 45 with me, and spent the last half hour of my session having a blast with the appropriate rod. Every Blue Gill Sunfish was a nice fight! It is so much fun to feel every twist and turn of the fish! The head shakes, the feel of the sunfish using its side motion to add to the fight! The runs to the left and right! The only thing a sunfish is missing in a fight is jumping out of the water like a rainbow trout. So if you are using a Carp rod for smaller fish, you don't know what you are missing out on. Hey Les. No, I don't fish for carp. Don't think I ever caught one. I do fish for trout. Have caught some planter's (6 - 8" trout). I just like how easy it is to set up tenkara style. I totally understand about fishing time! Never enough! So when you do get a chance, use it wisely! I also like how compact it is. Stow in the car, or a luggage bag. And cheap enough not to worry about damage! Carl, I like what you are doing! I've wondered if building a tenkara rod was a possibility? Kits, blanks, etc? yes, you "modified" yours but it makes me think it could be possible to build one from the blank up so to speak?! Might be fun! let us know how they perform! 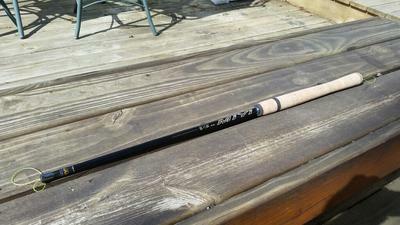 I re-finished an old St Croix spinning rod ( an old honey colored fiberglass one ). looks pretty nice! enjoyed doing it. have fun out there! Also, Hey Hoppy D! Thanks for the line! Can't wait to get out there and compare it to the line that came with the rod! Tight lines and no reels! Mike W.
There are tenkara blanks so you can build your own. Tenkara Customs is the name of the company. Google can find it for you. I know the owner and the rod you build will be much better than a $5 thing off eBay or Amazon or Alibaba.